Manufacturer of a wide range of products which include Coconut Plants and Terminalia Mantaly Plant. 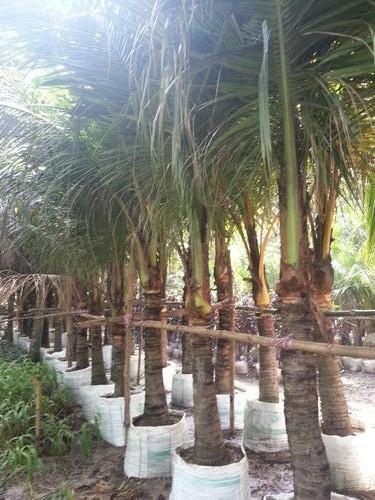 Matching up with the ever increasing requirements of the customers, our company is engaged in providing Coconut Plants. The coconut palm (also, cocoanut), Cocos nucifera, is a member of the family Arecaceae (palm family). It is the only accepted species in the genus Cocos. The term coconut can refer to the entire coconut palm, the seed, or the fruit, which, botanically, is a drupe, not a nut. The spelling cocoanut is an archaic form of the word. The term is derived from 16th-century Portuguese and Spanish coco, meaning "head" or "skull", from the three small holes on the coconut shell that resemble human facial features. Found throughout the tropic and subtropic area, the coconut is known for its great versatility as seen in the many domestic, commercial, and industrial uses of its different parts. Coconuts are part of the daily diets of many people. Coconuts are different from any other fruits because they contain a large quantity of "water" and when immature they are known as tender-nuts or jelly-nuts and may be harvested for drinking. When mature, they still contain some water and can be used as seednuts or processed to give oil from the kernel, charcoal from the hard shell and coir from the fibrous husk. The endosperm is initially in its nuclear phase suspended within the coconut water. As development continues, cellular layers of endosperm deposit along the walls of the coconut, becoming the edible coconut "flesh". When dried, the coconut flesh is called copra. The oil and milk derived from it are commonly used in cooking and frying; coconut oil is also widely used in soaps and cosmetics. The clear liquid coconut water within is a refreshing drink. The husks and leaves can be used as material to make a variety of products for furnishing and decorating. It also has cultural and religious significance in many societies that use it. Leveraging the skills of our qualified team of professionals, we are instrumental in offering a wide range of Termanalia montaly Plant.